Name Tags on Uniforms | Ace Uniform Services, Inc.
We all understand the critical role uniforms play in keeping employees comfortable and safe. Name tags are a quintessential element of the uniform that seems unimportant to many but makes a huge difference. We all understand the critical role uniforms play in keeping employees comfortable and safe. But uniforms, or the lack of them, also say important things about your business. Name tags are a quintessential element of the uniform that seems unimportant to many but makes a huge difference. There are lots of ways that including a name tag as part of your uniform requirements can improve your business. Wearing name tags makes it easier for your customers to both identify your workers and initiate conversation. It is hard to walk up and talk to people, even people you need to talk to, and knowing the person’s name before you talk to them can make it just a little bit easier. If you don’t have a corporate uniform, name badges can be a good way to tie each employee to your brand. The name tag itself can include your logo and brand colors, and link each person into a cohesive group, even when they are wearing different clothes. This is also true if you require a uniform for some employees, but your managers or administrators wear business attire. Having everyone wear the same name tag unites them and promotes equality. Name tags unify your employees, but they are also a great way for each employee to showcase their individuality. Whether this is by allowing them to use nicknames or to add decorative elements that highlight their interests, it allows each employee to express themselves without breaking from the uniform. As an unexpected upside, many young people think name tags are wonderful for precisely this reason, and they are happy to wear them. Wearing name tags also promotes security in your business, especially if you don’t require uniforms. When everyone who should have access to an area wears the same style name tag, it makes it easy to spot people who shouldn’t be there. Requiring name tags makes it easier for your security personnel to know who belongs and who they need to approach. Having your employees wear name tags makes them recognizable to customers, and also immediately puts customers at ease. There is something about knowing the employee’s name that makes the customer more interested in finding out more about the company and more likely to make a purchase. 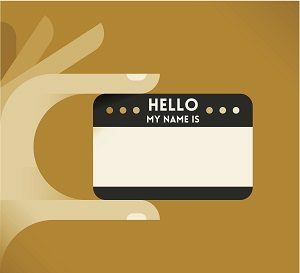 Think of your employees’ name tags as an open invitation to your customers to get to know you and your company. This entry was posted on Friday, October 5th, 2018	at 10:19 am	. You can follow any responses to this entry through the RSS 2.0	feed. Both comments and pings are currently closed.